This is one of my staple salads. It’s refreshing, substantial and extremely versatile. Now BBQ season is well under way, it makes a perfect accompaniment to anything you can grill from fish and burgers to peppers and halloumi. 1. Roast the hazelnuts in a pan with a little oil. Once browned leave to one side to cool. 2. 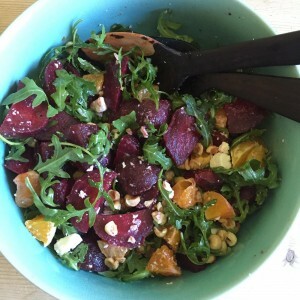 Chop the beetroot into quarters and chop the orange into small bit size chunks. 3. Toss the beetroot, rocket, orange and hazelnuts in two tablespoons of oil.